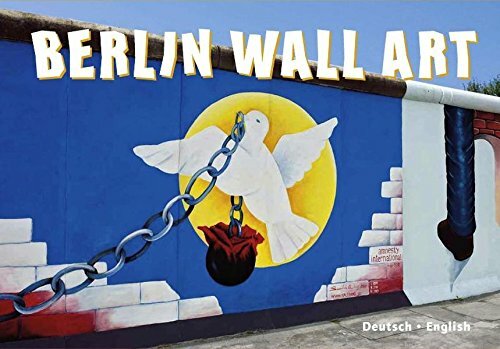 In February 1990 118 artists from 21 countries came together to memorialize the fall of the Berlin Wall. 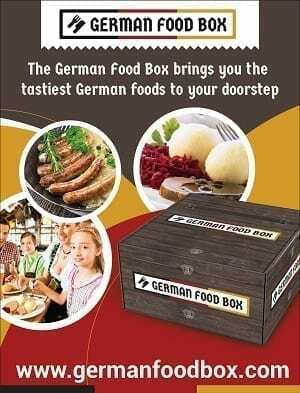 Their incredible plan was to create a visual representation of the joy and energy felt in Germany and around the world. When they were done in September, 1318 meters of Wall were painted with a string of murals that would become the East Side Gallery. Years of exposure to weather, graffiti artists and even vandals have taken their toll… but the East Side Gallery Berlin is still a must see attraction in a city that is full of Art and History. My daughter and I walked the length of the gallery one cold Spring morning enjoying the amazing works. 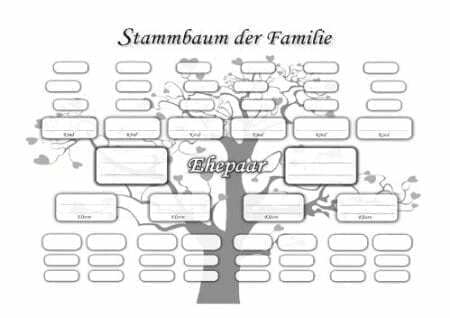 This is what we saw and learned…. You will find the East Side Gallery on Mühlenstraße in Friedrichshain-Kreuzberg. It runs for over a kilometer, right along the Spree River between the Oberbaumbrüke and the Ostbahnhof. To be technical, the wall is the remains of the inner part of the Berlin Wall. The actual East/West border was the Spree River. A wide sidewalk runs alongside the gallery, making it a perfect place to take a stroll and enjoy the paintings (and the sidewalk is wide enough for you to step back and get a photo without stepping into traffic. Each section has a marker to let you know who who painted that particular section (perfect for people like me who crave information). 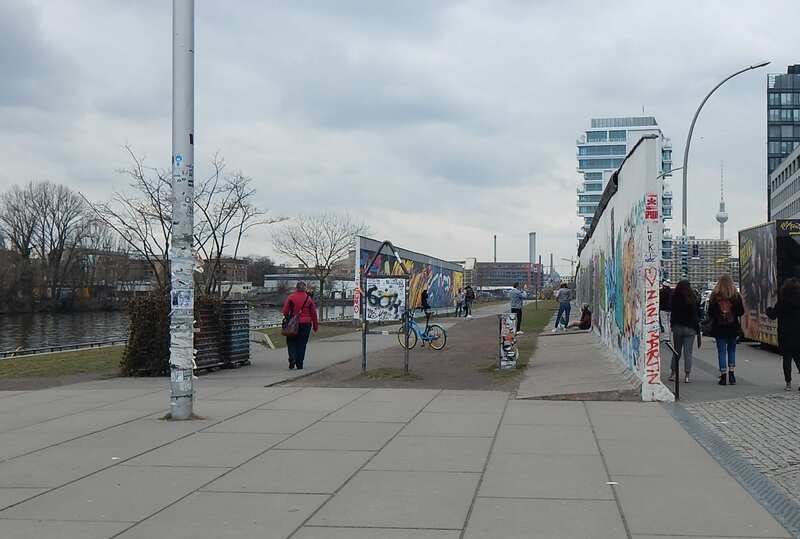 What Will You SEE along the East Side Gallery? Walking along the Wall, you realize just how many of these incredibly iconic works are familiar. Who hasn’t see Leonid Brezhnev and Erich Honecker’s famous lip lock in Dmitri Vrubel’s “My God, Help Me to Survive This Deadly Love” aka the Fraternal Kiss? And of course, Birgit Kinders’s blue Trabant breaking through the Wall! And my daughter’s favorite, Thierry Noir’s “Some Heads”. But there is so much more!! In 2008, the Artists’ Association for the Gallery were determined to give the Wall a proper restoration. The 2,200,000€ fund came from a combination of sources, including Lottery money, State and Federal agencies, and EU donations. 87 of the original artists went to work restoring 100 of the paintings, while a construction team made necessary repairs to the wall itself. They finished in time for the 2009 20th Anniversary celebration of the fall of the Berlin Wall. Today the East Side Gallery is under the protection of the Stiftung Berliner Mauer who maintains the gallery, and works to clear up any graffiti that inevitably appears. But if you just want to take your time and really LOOK at the Murals, put on a pair of comfortable walking shoes and wander. You will be glad you did. 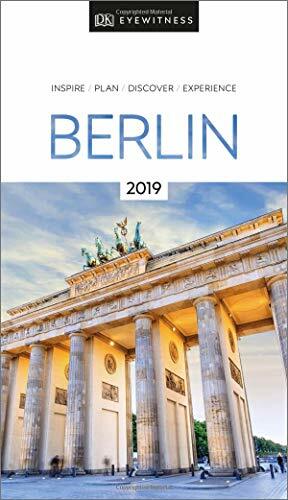 The Berlin Welcome Card offers free or discounted admission to many of the city’s Museums and Attractions. You also get discounts to many restaurants. Public Transportation within the city is also included. Honestly, this is the best deal in town. 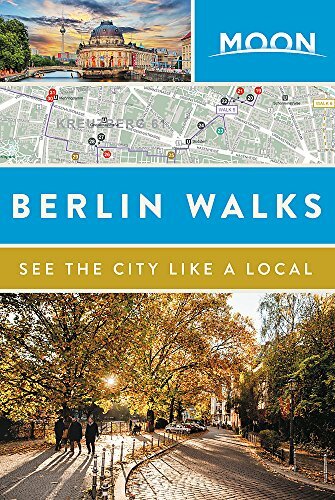 The Best Way to See Berlin… is Just To GO! I’m a huge fan of the DK series of guidebooks. 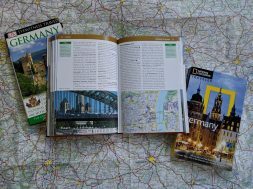 They include loads of information, maps and pieces of history. And it fit nicely into my travel bag. Katy lived in Berlin for 6 months, and wore her copy of Berlin Walks OUT. 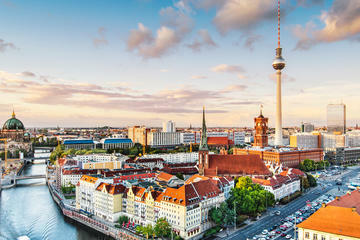 We highly recommend either or both if you are headed to Berlin.